A primeval number is a number that sets a record for the number of distinct primes that can be written using the digits of . For example, 137 is a primeval number because using its digits it is possible to write 11 primes, namely, 3, 7, 11, 13, 17, 31, 37, 73, 137, 173, and 317, and it not possible to obtain 11 or more primes using the digits of any other smaller number. 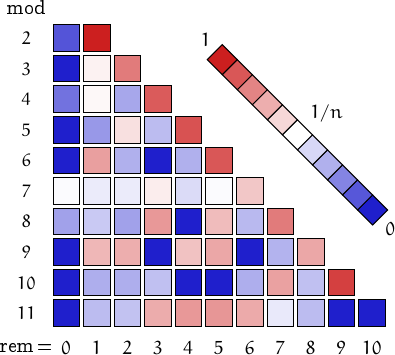 Using the digits of the 100-th primeval number (101234567789) it is possible to write 18451445 distinct primes. 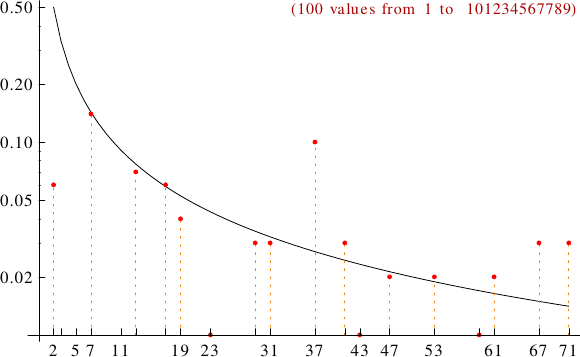 A graph displaying how many primeval numbers are multiples of the primes p from 2 to 71. In black the ideal line 1/p.